The core idea is that project teams need to be collaborative in order to deliver reliable and high quality results. That is a core requirement, whatever type of project you manage. We call this the culture of the project. CapEx projects have commercial arrangements between the key member of the project team – between client and first-tier contractors, and between these first-tier contractors with their supply chains. And these contracts do not always encourage and reward collaboration with other members of the project team. And this in turn can damage the project’s results. Even when you have a truly collaborative project team in place, with aligned financial rewards across client and supply members, that is not sufficient to guarantee project success. The team needs to be managed using the right methods of project management. form the core of Breakthrough Project Management. 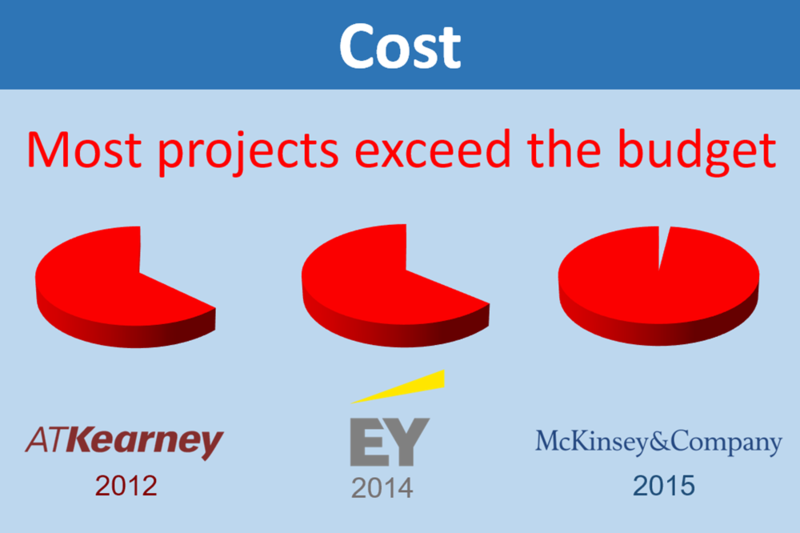 Most projects don’t achieve their objectives, as is clearly shown by the results of three global assessments of major capex projects, from a range of sectors, carried out recently by three global management consultancies. 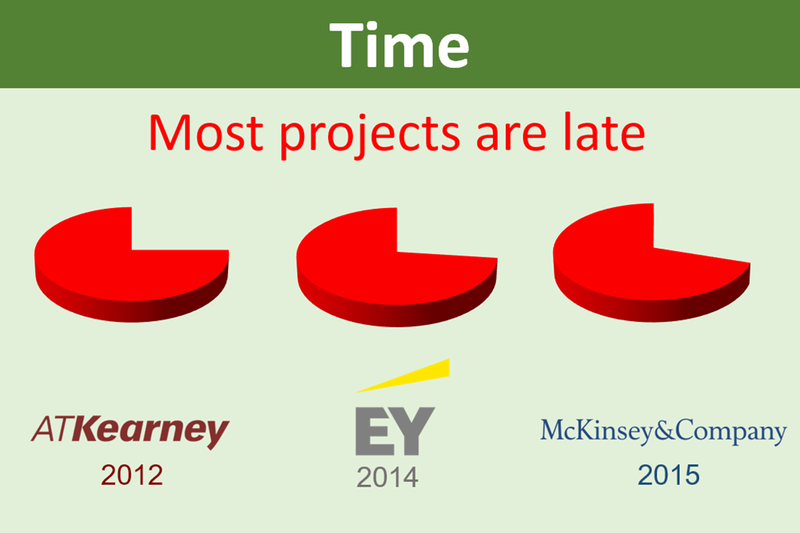 The conclusions are clear – most projects are late and over spend. And this is not all explained by under-estimating in order to get project approval! Whilst there is common acceptance that there is a problem with how capex projects are managed, there is less general agreement on exactly what the root causes might be. The reports that gave us the data behind these graphics, basically recommend that we “mange projects properly”, and they come up with a list of generally accepted truisms, encouraging us to get better at things like “senior management support”, “stakeholder engagement”, “risk management”, “managing scope and change”, “portfolio management”, “standardisation”, etc. And whilst we wouldn’t argue with any of this, we think it lacks substance, and that there is a much bigger issue. An issue that everyone recognises, but almost no one thinks of it as a problem. It is our view that the main cause of poor project performance is how uncertainty and variability are managed. Projects, and the thousands of tasks making up the project, are inherently uncertain. They take place in the future, and you have never done exactly this project before, at this moment in time, with these people. Project managers, and project sponsors do not like uncertainty and ambiguity. Try getting approval for a project if you say it will ..”take 12-19 months, and cost $50-75 million”. Even though this is probably an reasonable statement, we have to pretend we are more certain that we are, and so this project is said to take 17 months, and will cost $70 million. Projects are managed with a false drive towards fixed, single figure targets, and by dividing the project up into separate work packages that are managed relatively independently. The prevailing view is that is we look after the small parts well, then the whole project will be OK. That the performance of the project is the sum of the performance of the sub-parts. Big mistake! The consequence of this is that schedules and plans are inherently unstable and wasteful, contracts are adversarial and inhibit the kind of team-wide collaboration that is key to success. A Project Alliance is a collaborative contract form, that aligns the commercial interests of the supply members, with the client’s project objectives. It should include the main suppliers to the project, representing at least 80% of the total cost. It could be with a single main contractor, or with 2-7 independent organisations. A Project Alliance is basically a form of contract. Its primary purpose is to remove the barriers to collaboration between the different members of the project team. It does this be aligning the financial interests of the Alliance members. A collaborative team will reduce waste and improve the quality of solutions, but it does not happen automatically, it requires the active leadership of the project manager, and the support of the executives from all the alliance members. CCPM – Critical Chain Project Management is a technique for planning the project and for managing its execution. CCPM was developed to overcome the problems discussed above, and is the best way to manage uncertainty, and to minimise the impact of variability on the project’s success, that we have come across. 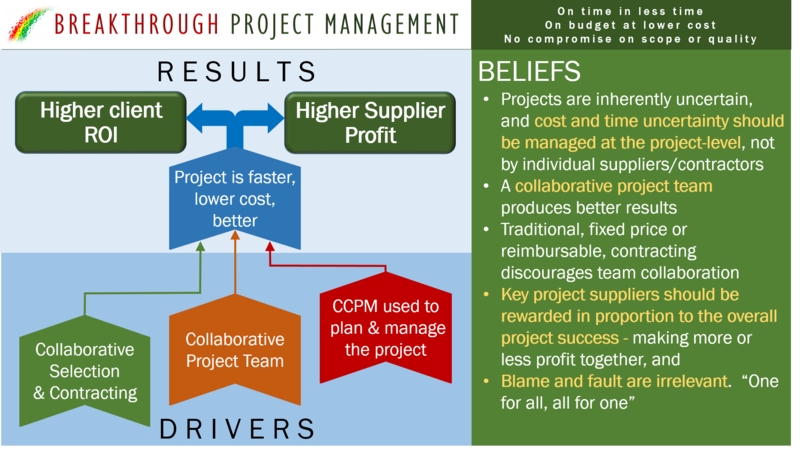 CCPM project typically complete in 20-50% less time than traditionally managed projects, with higher reliability, and using fewer resources. And it will only work with a truly collaborative project team.